We all like to keep our bills low. The process of spending and budgeting is never more evident than in the supermarket. But now news has reached many a-shopper’s ears about yet another ingredient to avoid. It’s palm oil, and this time, it’s serious. Or so the newspapers, online media and many campaigning groups would have you believe. In my line of work, I receive countless advertisements, graphic designs and reams of information about what planting palm oil is doing to the planet and what we can expect if the growing industry continues to prosper. We – as with all people foreign to any single country’s environmental issues – rely on non-biased global information to form opinions and contribute to general progression along the road to a prosperous and healthy life (and planet to go with it). So, on receipt of extremely visually upsetting photos and grim descriptions of what those growing palm oil do to forests and mammals (often orangutans), it is natural that we consider palm oil a very bad idea, that shouldn’t be grown, never, ever anywhere. Fair enough. As we don’t like what palm oil companies are doing, we are then told that a good method to tell the world (and presumably the Indonesian government) of this is to boycott palm oil from our homes and weekly shops. There have been numerous petitions, news and info-packs on how palm oil should be labelled on packaging and the various methods that food manufacturers use to cover it up. Long, long lists of complicated names are sometimes finished with ‘also avoid anything with generic ‘vegetable oil’ as a listing’ . Enforcement over clear labeling has apparently happened in Australia – a fantastic development and one which definitely helps understand how wide ranging the uses of palm oil are. As far as I understand, if you manage to find a pre-made food that does not use palm oil – the chances are it’s used to make the packaging. It’s useful for many foods, as well as being an ingredient in tooth paste, most bath room products – let alone whether it’s used as a fuel in factories to make these items, make the packaging or export/import/transport it. Palm oil into the distance. Thanks to http://www.orangutan.org.uk for the image. Long story short, we are looking at many hours and many changes to how we shop to even start contributing to the message of ousting palm oil from shop shelves. That goes along with another associated hindrance – the increased expense will be considerable. Constantly finding alternatives and sourcing food from alternative locations than large common chains can be difficult and tiresome. The product will have increased costs of production, transportation, shorter sell-by durations and are less popular – all round costing more money. All the extra inconvenience would be worth it, if this decreased purchase of palm oil products actually decreased the production of palm oil. If these shopping changes had a positive effect on Asia’s biodiversity and contributed less to the rates of climate change, then the process would be working. I won’t be focusing on palm oil grown out side of Asia, and indeed most of my knowledge is Indonesia based – please excuse this focus. Indeed if I get any of this blog wrong – do correct me – but this is my impression. The reasons that buying alternative products will not improve the general ‘bad palm oil situation’ are many, but by far the biggest contributing factor is basic economics – supply and demand curves. The demand for palm oil is far too high, all over the world, in almost every human’s daily life for the supply to be affected by a small proportion of people changing their supermarket shop. I am not sure at what scale we would have to decrease the demand by to warrant an effect on the supply, but I am betting it’s equivalent to whole cities or countries not buying palm oil. Which is not going to happen. One obvious reason for this (using the UK as an example) is that most people don’t have the income and profit margin to make this financial commitment without sacrifice. Once people start having to compromise their lifestyles, this becomes a ‘tragedy of the commons scenario’ – but I find this a digression unless writing a report. In short, there is simply too much palm oil being used by 9 billion people to mean that a few eco-friendly Liberal Democrats in Kent are going to make any difference by spending their time in Waitrose. A good counter argument (suggesting this behavioural change is worth it) is that if it makes them feel good – that they are working for a cause. Then of course go for it! Sincerely I respect them if they make such changes – but I would argue they can have more effect concentrating on a few other options. A key point to mention, which deserves much focus, is the current outlook on biofuel. Biofuel is seen as sustainable, but as it is made from sources such as palm oil, paradoxically we see that it is in fact not. It is arguably better for the environment than drilling for gas and oil, but as far as I am aware it’s still not a conclusive argument, because what goes into biofuels in what percentages is not yet fully comprehended. Perceptions on fossil fuels, ‘sustainable energy’ and nuclear power need to be influenced by the science that they’re based on – not by the media. I am not an expert on any of these, but I do know that hydroelectric dams and the proposed increase of use of palm oil should make us raise an ecological eyebrow. It seems to me that the general public in the UK and perhaps other countries are thinking about solving the problem ‘backwards’. The problem lies in Indonesia – so within Indonesia is where changes need to happen. I would argue further that other countries’ support would help this change, but that it is the Indonesian government and the Indonesian people who need to initiate and lead this change. This then becomes an issue of a politics and economics (including thousands of peoples livelihoods) – on an international scale. The land given over to palm oil production may belong to several different groups (locals, government, companies or no one) but there are little to no records of ownership and even less consequences to groups that just start using the land whether it is legally theirs or not. It is also increasingly easy to acquire areas of land where large sums of money are available. There is confusion, lack of awareness, lack of tangible rights/land-ownership of different groups, and the polarity in the economic background of the groups involved that makes miscommunication easy. It’s very hard for a person facing poverty to refuse cash – almost unobtainable in some areas – as well as the promise of increased job opportunities (some with contracted work – also very rare in some areas) – even if these benefits are at the expense of the health of the area they live in. All these components lead to an easy road for the companies with money (and land) to burn… and this is before they build the large forest-bisecting roads. 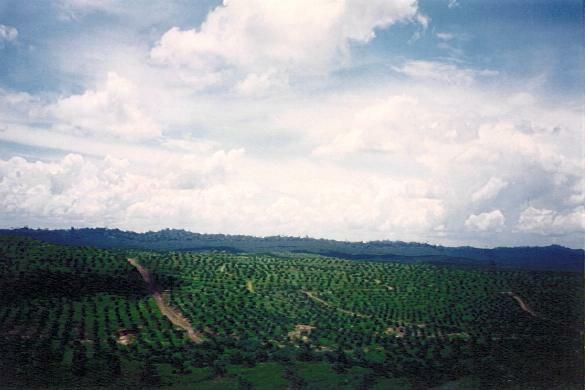 Crucial to understand is that there is an excess of degraded land for palm oil to be planted on. So why are hundreds of acres of valuable forest are chopped down, cleared and then (and only sometimes!) palm oil saplings planted? It doesn’t make sense in terms of time management. But it does make sense in terms of money management. Palm oil companies can sell the timber from felling forests at huge profits. The income is so great, the company can make a profit from the land just by selling the timber – it’s then up to them whether they then go ahead and plant the palm oil proposed for the site. To date, many sites remain un-planted and not producing oil. Firstly, much of the ground cleared for palm oil is cleared from peatlands, a specialist ecosystem that has evolved to provide a home to an incredibly rare community of plants and animals. These low-oxygen-based systems are some of the few that remain. When we say ‘damaging’ and ‘losing biodiversity’, we are including within that the loss of species from the planet, and the steps towards loss of an entire habitat. Secondly, the peat that forms the soggy ground of these forests provides an incredibly valuable ecosystem service: a huge natural carbon storage system. The water-logged systems support certain types of specialised bacteria, and these bacterial communities decompose the natural leaf litter in such a way that huge amounts of carbon are stored in the soil. The exceedingly slow rate of decomposition indicates just how old these systems are – and is a flag of warning of how long it would take to get them back. Taking into account the surface area of the peat, it’s depth and it’s 1000s of years of functioning – we are talking a lot of carbon. When land is cleared of trees and roots, via burning or logging and drainage, the soil and peat is dislodged, washed away and all the carbon is released into the atmosphere. Lastly (at least in this blog) is realising how the growth of palm oil embodies a vast percentage of disadvantages to the planet. Palm oil is a fast growing species, and produces more oil per plant (and so per unit area) than any other. As a plant, it acts as its own ecosystem service, providing oxygen and storing CO2. All these traits make it a very understandable crop to grow, which has the potential to benefit hundreds of people’s lives via jobs and its many uses. Fantastically, there is plenty of degraded land for palm oil to be grown on – humans just have to convince each other to use it! The biggest change we can each make as individuals is to understand the vast wealth of information offered on this subject – hopefully knowing when information in the media is well conveyed and when it is not. There are reports, articles, news, company policies, experts and scientific data that have all the information you need to make an informed opinion. By all means contact your local MP – can they tell you more about the uses of palm oil in biofuel? Ask them if they see a way of helping (working with, not campaigning against) the Indonesian government to proactively develop the situation to benefit their country whilst minimising the degradation of the planet. Ecologists, politicians, economists, activists, the people with money in their hands and the people who need the money can’t change things on their own – as you might expect, and as with so many economical-ecological threats to the world, we’re going to have work together on this one. Perhaps the first step can be clarity of communication of the current conditions. Below are some good links to start with – get Google-ing! And enjoy choosing your toothpaste.